I’ve been wanting to give away some of my new stamps since they came out at the beginning of July, but life got hectic as I finished up the manuscript for my book, traveled to Arizona to teach at Art Unraveled, to Washington twice for family events and I just finished up proposals for some of next years art retreats with only a day to spare before the deadline! That’s how it is at times and I’m sure you can relate as we all can get so busy. Even our own artwork can take a backseat at times, but I want to encourage you to use your art journaling to fill the void when more complete works of art cannot be created. I decided to use one of my new stamps to jumpstart a journal page I needed to do for the Sketchbook Challenge theme of ‘Shelter’. This made journaling with limited time doable and fun as I let the page unfold. It’s simple, for every 50 comments I’ll give away a stamp from my new line of Poetic Portraits stamps!! So just take a moment and leave a comment about what creativity you’ve been up to this summer and spread the word because I’d love to give away a lot of stamps!! I will draw names on Friday the 17th!!! « Susan Lenart Kazmer’s Industrial Chic Blog Hop Begins! WoOt, wOot Pam Carriker! I LOVE your art work and your use of the Jill Berry’s Stencils! I would love to win these stencils! I am new to your website, but love it, & have used it for inspiration so many times! Your line of stamps are absolutely incredible!Thank you for sharing your artful soul! The summer was spent doing a little of this and a little of that in my typical less than laser-like focus. Did some journaling, made oodles of postcards collected raw material for mixed media assemblage and assembled an item or two. Cool stamps, would not mind adding to my collection. My wife wants to win so I’m entering for her. This summer I have helped her with a project where she is turning an old window frame into a magnet/cork board. I’ve also been installing a roll cage in my truck. Just a few more comments and she will give away four stamps instead of three! Come on crafters…let’s do this! those stamps would be so much fun for making cards!!! want to win!! Pam I would be remiss if I did not tell you how wonderful I think your art and you products are. Thanks, Pam. I’ve been working with alcohol inks; the possibilities are e ndless. And in between, I’m gleaning lots of new ideas from artists such as yourself. Thanks again for sharing your creative spirit with us. I love how whenever I’m browsing my art mags…I can instantly spot your work! You always inspire me to find my own niche. Would love to do some journaling with your new stamps…just love them! Thanks for sharing! Beautiful stamps, Pam. Just beautiful. I am doing lots of drawings and loving it because i took your class. I am not missing the class because we are now in a group. I see my classmate works all the time and get to comment. I have tried your products but I do not know your stamps yet. I would love to work with one of your stamps. Art journaling up the wazoo! 🙂 I’ve been sewing and painting and collaging and it’s been fabulous this summer. I was saying to myself, I need to incorporate more stamps other than letters/words. The window of creativity doesn’t happen all the time with a cute 1 year old, but when the house is quiet (between 9pm to midnight), I get busy creating! OK!! I’ll bite…I would LOVE to be the ever so lucky person to win your stamp!!! I do admire your work. Thanks for the opportunity. Beautiful stamps!! I’ve always loved your designs! They would be perfect to use in collage projects! Have been using to use alcohol pens and how to blend and shade so the images don’t look flat…use your face stamps for flesh tone practice. Love working in mixed media! Your style is so inspirational. What a great jumpstart. I would love to win one of your stamps. Have a wonderful day, Pam! I have moved to a brand new home so the studio is in an uproar 🙁 Love the new stamp line! I have been loving working in my art journal this summer! Taking your Still Pursuing Portraits in June really jumpstarted my interest in drawing so I am trying to combine that with other art techniques in my journal. Thanks so much for all your inspiration! Oh how I hope I win one of your wonderful stamps. Love your art. Thanks Pam for an opportunity to win one of your stamps. I have not done much this summer with stamping, sketching etc as we are planning a big move down south. I know you can relate to that since you have been through the move thing yourself. I’ve always said I can’t draw or paint but surprised myself with an on-line quilt painting class, so who knows may be I can do faces too! Hmmmm…creativity this summer??? I’ve been busy with my kids and our new puppy. BUT…this summer I realized how much I miss jewelry design. I made a few cool bracelets and have decided to try to re-open my biz I had 20 years ago. Back then, ETSY didn’t exist so maybe I’ll open a store! Your stamps are very unique, making them fantastic and very inspiring. As usual I love your style of art. Your stamps are very unique, making them fantastic. They do inspire a lot of creative ideas. I did your online course “Still Pursuing Portraits” at Artful Gathering this summer and enjoyed it immensely. It was my first time to do an online course and I can’t wait to do another one. I learned so much and now have the confidence to continue practicing drawing and painting faces. I love your new line of stamps and would love to win one. OMG, just what I need to jump start my journaling! I have BPS–Blank Page Syndrome. (Very common in people with A.D.D.–hehe) I’m in the middle of doing a colored pencil of one of your faces in Art at the Speed of Life–a stamp would have saved me loads of time—just sayin! hehe SERIOUSLY, love your work –especially love the colors you use. Thanks for the chance to win a stamp. aren’t Pam’s stamps wonderful….there is a youtube video…that you can learn how to carve your own stamps….if of course …we….don’t win one…I have done this…and believe me…it is great fun…. 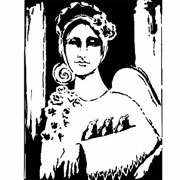 Winter here too in NZ, perfect time for inside time artwork – did your online pursuing portraits, you make it easy with your instructions – the new stamps look wonderful in your artwork. time I see an angel like this,! Thank you PAM ,for this lottery fingers crossed hoping to win a face stamp…. your 3D portrait class looks intriguing! love the stamps…..
Love your new stamps, Pam. I’ve been working on the Sketchbook 2013 project out of the Art House Coop group. Also, I did an in-house art residency for two weeks this summer. Trying to keep it going each day with a daily sketch..my theme this week is birds. Working full-time and traveling a lot to see my new husband keeps me pretty busy. Thanks for the inspiration. Love your journals. Oh Pam.. how exciting. I’ve been playing with some spray inks on paper and fabric. Using stencils with heavy gesso. So glad to be back in the studio. I’ve been playing with Inktense Pencils and water, so fun! I play with my watercolors, mixed them up to see what colors I can have. An d do some pages in my Moleskine. Have a nice Summer Pam. Best of luck in all your art adventures! Well this summer has flown by so fast. I feel like I have not accomplished anything in art. Like many I too am trying to find my voice in art. Everything new I have tried I love but can’t seem to find me in it. Think my hands are into too many things and I need to take a step back and figure out what I like the best. Thanks for the opportunity to win your stamps! Love all your art! i’ve been busy this summer with lots of different art projects, samples for classes and writing articles for magazines. love your new line of stamps pam! sounds like you had a wonderful summer! This summer creatively has been a challenge all it’s own. I am in France working, lots of long crazy days. I brought a suitcase of art supplies which is now turned into two buldging suitcases of “old books & goodies” for collage. I have scoured the broante & flea markets for more goodies as well. I have made a inspiration deck for a collaborative project as well as two pages for another group “For the Love of Creativity” both were collage and with a group of ladies I adore. We took Kelly Rae Roberts class together last year…. I have also been collecting found objects so I can make a steam punk portrait someday. As well as gluing gluing gluing to my sketch book for backround.. A few journal pages as running like a chicken (work) allows. My paints are screaming my name. I also have done a ton of photos, a few sketches. I also carved some wine bottle corks into stamps. This has been about working with what I find. Now about you. I adore your stamps! I want to learn making stamps as well as portraits!! I love the stoic-ness of their faces. The regal way that the look so deep in thought.. I have a Picasso print of a king regal looking guy that they remind me of… Amazing, someday I hope my bliss will help support my world.. Your journal page in this post is beautiful too. As usual your Art is unique and beautiful. Love to see your passion! Very Inspiring. Have a great day Pam. Thank you for this opportunity. I am recently trying to sketch faces with some success but need to work at it quite a bit more. I enjoy your artistic style. Love your new line of stamps!!! Awesome!!! Everything thing you do inspires me,now the awesome stamps! I love them!!! PAM ~I went to a local goodwill store & picked up a bundle that cost $8,& got about $60 worth of goodies for art journaling. so i’ll be working w/ more alphabets & butterflies, & glitter glue, & carving of s.mars erasers for stamps & I’ve been “painting” w/ my petunias & marigolds in lovely purples. p.s. i LOVE your stamp -w/ the lady w/ the arm – THAT ARM could be used in a myriad of ways. thank*you for the contest ! I love the idea of using the stamps to quick start some journaling! My latest projects include an art journal on the theme of mermaids, renewing my love of sketching with your Artful Gathering workshop and making collaged bangles. It’s been a lot of fun and creative growth for me. You’ve been a great inspiration for art journaling. Thanks for all you share! Love your work and your products! I’ve taken many of your online classes and one in CN last year and have throughly enjoyed every moment! This summer I am repurposing an old window frame that I picked up years ago at a flea market. I have sanded it and painted it with a crackle finish. I have put cork into three panes and my husband cut metal for the other three panes. I hope to finish it this week. I have also been stamping multiples of a new thank you card design I came up with inspired by a card I saw in summer issue of Take Ten. Thanks for the opportunity to win one of your lovely stamps!! After Pursuing Portraits finished, I joined Diary of Faces, which has been a perfect compliment to PP. The continued support from many of the PP members and the Diary members has inspired and instructed me to keep on learning and growing. I’ve been super inspired after taking two of your classes at Create this summer! I’ve carved two linoleum block faces and created lots of journal pages. Kelly and I even journaled some more together on our summer trip to Lake Tahoe! Thanks for all of your inspiration and your giveaway! Up until July 13th, I had been working on SLJ2012 with Stephanie Ackerman and doing a submission to Somerset Press. Then on that fateful Friday, my husband suffered a stroke and for the past month I have been working with his recovery. He does better every day but some of his memories (our memories) are limited to the journal pages I have done over the years. I am so thankful for those journals but my heart is broken that he may never remember. Hug & kiss those who are near & dear & tell them I Love You because you never know what tomorrow may bring. 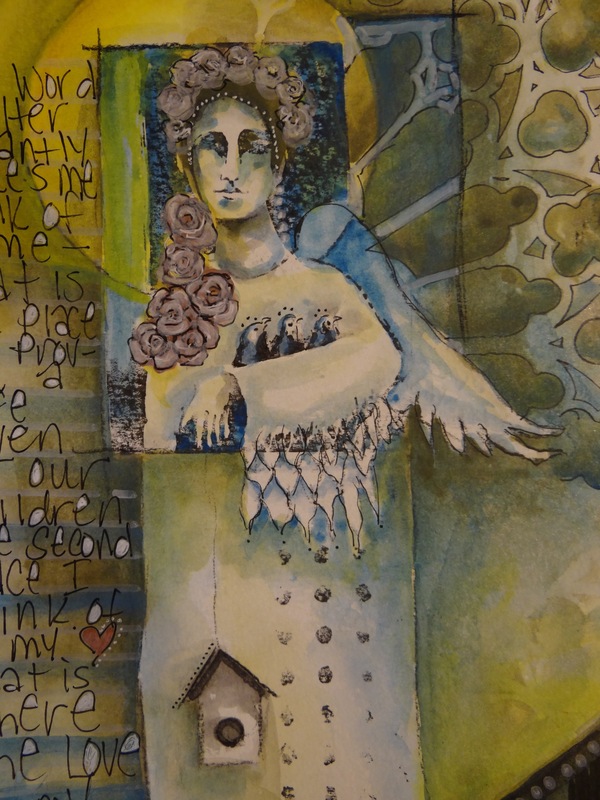 I love your work and mention your blog on my list of favorites for my art journaling students. Would love to win one of your new stamps…count me in!! I really enjoyed your “Still Pursuing Portraits” class this summer, Pam! I’ve been playing with canvas, collage and wax. Love your new designs and the lady with birds is actually my favourite. Oooh! fabulous stamps!! Well, I’m fairly new to the mixed media arena and have been trying to absorb as much info as possible. I’ve been a papercrafter for about 6 yrs now so this is all very new to me. But, I am totally addicted already! I have started an art journal and have enjoyed getting used to using Gesso which can seem intimidating to use at first. At least for me. I was getting bored with just making cards so branching out to something totally new has really kickstarted my mojo again. Thanks for providing us a chance to win! Pam – I had such a great time in Arizona at Art Unraveled and learned quite a bit about carving stamps. Thanks for two great classes! Hi, Pam. I just got back from Art Unraveled, where I took your Puzzling Portraits class. It was great! I finished my portrait and love it! Now, on to finish other Art Unraveled class projects. I’ve taken many of your online classes and 2 from you (in person) at Art Unraveled. You are an excellent teacher and I’ve learned a lot from all your classes. Your new stamps are all lovely. Thanks. Those are fantastic! I love Jane’s little houses,makes me want to do some 3D journaling! I’ve been sketching portraits since you gave me great lessons during artful gathering and I’ve been working on my Encaustic painting skills. Love your stamps. First off, Pam, congratulations on all of your success. I have been following you since your first book and you keep me inspired. I am a crafter and am finally getting back to selling my items at a craft fair. It has been 10 years since my last fair. I am excited and can’t wait. Maybe next year I will be able to incorporate some art into my crafts. Thanks, Pam B.
I’ve been making prayer flags and postcards. It’s been so relaxing to do some hand stitching. Love the stamps!!! Just as you said we can all get caught up in living life, it gets hectic at times.I love my journals as I can be creative where ever I am and do as much or as little as I want.Love your art work. You inspire me .Thank you. what an awesome giveaway! I would love to be able to use one of your stamps in my art journal! I love the new stamps! Not sure I could pick just one. I lve the new page you created! As a student from your Still Pursuing Portraits class, I’ve been sketching faces and am currently doing one in acrylics. My friends & family are amazed thanks to you! i love all your stamps. I have been carving lino I found on our lake bottom!! This summer, I’ve been using everything I learned in Shades of Grey, Pursuing Portraits, and Still Pursuing Portraits. In between, I’ve been scrapping, making jewelry, playing with clay, and participating in a monthly art exchange, just to name a few! Self-portrait, quite unexpectedly, not just the face but also the middle-aged shape. Wow! You are so ingenious! Look at what you can do with a stamp! Who would have thought….. I hope I’m lucky today! Thanks for the chance to win! Totally unexpectedly, it has been self-portraits ; not just the face but the middle-aged shape! Im new to journaling and would LOVE one of your stamps to use!! Thanks to Pinterest I’m more inspired and creative than ever. All of the beautiful projects give me ideas on how to make my own art better. And all of the hubbub about art being posted on Pinterest without credit to the artist gave me inspiration to write a series of articles on how artists can use Pinterest to sell more on Etsy. I’m involved in an altered book/art journal round robin, so that introduced me to art journaling. A person involved in the round robin is hosting an event that I’m sponsoring so I designed an art journal apron for a sponsor gift to be given away at the event. One creative act is leading to another and I haven’t been this happy or productive in years! I have been loving index cards, my art journals, and painting lately. And I have done a bit of knitting, though I am in winter not summer. I love your stamps. I’ve been drawing and making quilty wall hangings. I want to do more creative things! I am excited about your new stamps. I spent 6 good weeks rushing around doing regular things to sit down and view a video and draw in your Artful Gathering class. I learned so much. I am now continuing on with the drawings and using your skills that I have learned. I don’t want to stop. I’ve been challenging myself to work on lettering and faces this summer…and while my lettering is improving the look of my art journal pages, my faces still look more like corpses! That’s where your face stamps save the day. I love that they are detailed and yet “neutral” enough to use again and again in different ways. This summer I have combined my need to cut expenses with my love of using found objects in art. I have been taking the bus often, walking more, and finding amazing little treasures to use in my art work. I am working on a “Yellow Found Object” collage at the moment. Love all your stamps! Looking forward to many years of inspiration using these stamps! I just had a little surgury done a few days ago. This is a good time to do some art journaling. Your new stamps look amazing! this stamp line is fabulous, would love to have the opportunity to play with some of them, unfortunately art budget non-existent at this time! I enjoy your work so much, thanks for the inspiration! I’ve been working on a daily journal. It’s been so much fun to experiment with different types of backgrounds, stamps, stencils, etc. I’d love to try one of your stamps on one of my pages! Love Love the new stamp line!! I enjoyed your workshop in CA Creates and have tried my hand at carving……your pieces were such an inspiration!! Thanks! I have been in the house under air since it has been so gastly hot in Wisconsin. Time to create art however. I have a stamp club once/mo which we are making book pages for each person. I am in an ATC swap group and making birthday cards for the entire year. Made a photo cube for my dad for Christmas and odds and ends….of course, reorganizing AGAIN. I love your new stamp line and it gives me inspiration to carve from photos. Love you work!! Very cool stamps! I haven’t “stamped” anything in many years…these might inspire another round! I love your stamps and it would be a pleasure to own one! Thanks for your kindness in doing this giveaway! Pam — ever since accidentally finding one of your YouTube videos, I’ve been a fan. I loved taking the Pursuing Portraits class and would be over the moon to actually have one of your stamps! Thanks for all your continuing inspiration and willingness to share your knowledge. I painted a mixed media page for my friend’s daughter. My friend made a special scrapbook for her that included pages of encouragement from lots of women in her life. It was very special to be a part of that project. Thanks for the chance to win one of your new stamps. Love the page you created. I love what you did with her! How the work from the stamp flows down the page, so there is no start or finish with where the stamp ended and your other work began. I continue to learn so much from your art! I love your stamps and your artwork. My sister Penny turned me on to you and your art. It is my goal to continue to grow as an artist and will certainly look to your work as inspiration. Thanks for sharing your gifts and talents! Would love to win one of your great stamps, especially after seeing what you did with the one above. Very cool! Hi Pam, I just started back art journaling after a long hiatus. I joined 21 Secrets and it gave me the jump start I needed. I particularly enjoyed doing a page of cut out butterflies of different sizes flying away across a blue sky. I love your new stamps. Hi Pam! I have been trying to journal every evening. Sometimes I dont have the time for an artistic spread so I just write some thoughts, add some color and some stamps. Going theough a rough patch in life right now and journaling keeps me sane! Love ur stamps. Still waiting for a class on the fisrsketch stamps you did! Hugs! wow your stamps are wonderful, loving the beautiful classical faces. My summer has been full of ups and downs but have been able to express it through my art journal; would be lost without my art, perhaps I should call it My Life in Art and drop the word journal. LOVE LOVE LOVE your painting made with one of your stamps!!! Such a lovely, serene composition!!! I’ve spent my summer making some beautiful and some not so beautiful faces ever since taking your portrait class early in the summer. I try and create one several times a week. I still watch the DVD over and over… you are a wonderful teacher! I’ve been playing with new Matisse products and raw canvas and having a blast. BTW, I love my new favorite Mixed Media Adhesive. I have never found a product that does not leave shinny glue marks and works as good as this. I am a customer for life! I’ve been creating the proverbial silk purse from a sow’s ear. I’m in the midst of turning a badly damaged and neglected foreclosure property into an antique store. The 1850s farm was once a stagecoach stop and I’ve been uncovering all kinds of original features and history. The downstairs and the studio are open for biz – still working on the upstairs and out buildings. What fun! LOVE, LOVE, LOVE your new stamps, Pam!! My creativity has been spent in different ways this summer. We are moving, so I\’ve spent time texturing and preparing walls for painting, along with decorating new spaces. I\’ve also spent energy planning for a switch to homeschooling and finding creative ways to approach curriculum and subjects after teaching multiple subjects to multiple ages in the classroom for years. I\’ve also begun writing a couple stories that have been in my head for a while. I\’m looking forward to finally finishing the moving process, though, so I can pull out my supplies and move back into a creative space in my life. Pam, I love your art and would be thrilled to use your stamps in my art journal. I’ve been spendng he summer watching the videos and blogs and trying new techniques. I loved the artwork you created with your stamp! It had beautiful color and showed creative ways to use a stamp that was different than using a stamp with a design! Nice work and a great piece to show how versatile your stamps are in creating journal pages! Love it! Finished 120 hand made accordian book wedding invitations to my son’s wedding in September!!! Got rave reviews… Now turning creative juices toward new (first) grandbaby by making a woodlands creatures baby blanket and onesie. Am ramping up ideas for making onesies with stamped, appliqued, painted fronts. Looking for ways daughter and I can become productive on Etsy to help her transition to a part time creative income. Such an exciting year for me. I have been brought into the world of journaling and stamping by my loving ssiters who are the artists in the family. But through adding my hand to the new world of these adventures, i’ve found that some of that talent does lay in some of my attemps. Would love to add some expert stamps to my ongoing adventures. My Sista Judy~~~you are so very talented…we have just opened a door to your own creativity….you are the more talented than you will ever know! Still working on portraits from your Artful Gathering class. Guess I should say “still pursuing…” In any case, I loved the course and really appreciate your skill in teaching, beautiful artwork, your generosity, and dedication to family. they are absolutely brilliant Pam! wonderful is this piece you created with your stamp. such a nice give away too! summer creativities… lots of art, photography, poetry and listening to the business of nature’s summer. Wow I love your new stamps…the one you used on the journal page is calling my name! I have been busy this summer babysitting grandkids, so not a lot of creative time. I signed up for Lesley Venable’s class bundle and have managed to take a few classes locally. Hopefully soon I will find the time to use some of the things I’ve learned in classes! Enjoy the rest of your summer! Have just moved into my first home, art journaling has taken a backseat … nonetheless … as a creative and artist being I am using my creativity to organize, decorate, and “nest”! I’d love a chance to win on of your stamps! Lovely stamps! I’ve been up to some fun mixed media projects this summer. Awesome stamps and love how you incorporated into your shelter piece. Me busy? Sketching every day, painting those sketches/drawings keeps me on my artsy toes. Makes life come alive to me in new ways not before realized. Increases awareness, observation skills sharpened hopefully keeps my mind alive and well! Hi Pam…yes, I can soooo relate to your busy-ness! After taking your workshop at Artful Gathering, I was inspired to draw faces for the first time in my life, sure I’d be drawing regularly. Then I found myself with my first ever art commission that has taken up almost all of my waking hours…and doesn’t include one face! As they say, we make plans and God laughs…thanks for all YOU somehow manage to do! Yes, indeed, those stamps would be the perfect start to art journal pages. Would love them! I have been working on watercolor lettering this summer. I would love to say I got a lot of scrapbooking done but I haven’t. I have kept pretty much up to date with my Project Life album however so that is some scrapbooking done. I’d love to win! Your stamps are just gorgeous! I’ve been working on a lot of cards, a shrink mosaic canvas, as well as some fabric pieces including baby blankets. Please toss my hat in the ring. I would love to win some of your artfully drawn stamps. I love your work and I really enjoyed my online class w/ you in the Strathmore Journaling Class. You are fabulously talented. Love your stamps! This summer I took the drawing course from you at artful gathering which has helped me immensely, did a large scale painting for my daughter, am taking a course with Sharon Tomlinson where we are painting a portrait a week for 18 weeks, and am about to take a class from Michael Demeng. I normally cannot do this much at once, so am very grateful to be having an art filled summer. Your stamps are awesome Pam. I can’t wait for everyone to go back to school so life slows down. I’ve only done little projects this summer, and one big one- renovating our bathroom! Joy! I’m looking forward to CREATE to jump start my autumn creativity. Hello Pam – I’ve been creating handmade journals, etching brass cuffs and Zentangling. I enjoyed the class you taught at Create. It was a pleasure meeting you. Thank you for the opportunity to win one of your stamps. awesome work. as soon as i get a computer at home i ‘m taking online classes. I love your way of looking at the world! I was uber busy and that usually makes me uber creative – summer flew by! I love your art here … that cathedral-esque window!!! I just finished a class on icon writing (which I’ll be posting about later today). We wrote an icon of Jesus … it was a week long intensive and yet contemplative class. Amazing. So that and art journaling has been what I’ve been doing. These stamps are so beautiful and unique. Congrats, and thank you for sharing your considerable talent. Thank you so much for the great giveaway opportunity. I love your stamps and the inspirational on your blog. You are so talented! This summer I have been working on journaling in a smaller scale. I purchased a small journal with recycled paper and it’s been fun trying to fill a page each day. No so intimidating. Pam. The stamp line is wonderful and incorporating one into a journal page is a great way to jump start a blank page! I will give it a try! Your new stamps are lovely! Thank you for the opportunity to receive some. I believe i have spent more time thinking about being creative than creating. I will need to change that! My summer has been all about art journaling and bookmaking. Your stamps are perfect to use in art journals – any art, really! They are so cool and different from everything else out there. Congrats on your new stamp line! I just love your style! Hi Pam, I love the new stamp line and have learned so much from you. Looking forward to the new book too! I’ve been making handmade journals from the paper I’ve collected. Your stamps would be a great way to start a spread. Trying to keep in creative mode and have been, playing with stamps, stencils and journaling over the summer. Would love to sin one of your stamps. Terrific to see how you incorporated the stamp and it certainly makes me want them all. I just joined Sketchbook challenge yesterday so I will see you around over there. I have been creating for Post Art for Humanity and completed pages for the Weird Wild Wonderful Swap. I took two classes at AG…as you know one of them was your portrait class. I’m about to take a class with Michael DeMeng and a retreat/writer’s workshop at a lovely B&B with humor writer Wade Rouse. That’s just the tip of things, but always love seeing your posts. Thanks for a chance to win! I’ll talk about this on my Blog & FB. Lately have been making bits & pieces for some dear friends…special bookmarks, cards-and starting to create larger pieces for the fall “stamp”ede. Your “Shelter” piece is absolutely beautiful…maybe if I use these stamps it’ll create some magic for me as well. Thanks for the opportunity to win, Pam. 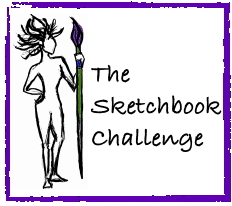 Hi Pam – what a wonderful new series and this page for the Challenge is wonderful! I would love to win one of your new stamps and am certain it could be put to good use. Hi Pam, your stamps are delightful! I love to play in my Art Journals. They are a great diversion, plus they are a wonderful way to try new techniques. Thank you for your inspiration, and lovely way of teaching. I love your style!!!!! Thanks for the opportunity to win these awesome stamps! I’ve kept creatively busy this summer taking classes at various retreats (can’t wait for art is u in Oct!) and working on any type of art I can get my hands on, lol. Currently I’m doing a lot of casting but also crocheting and redecorating the house. 🙂 Today I’ll be doing some sketching alfresco and abandoning. Would love your stamps to kick start those! Amazing artwork. Your work is just so evocative! Well, let’s see…I’ve been sketching in my sketchbook, drawing and then painting, natural dyeing on fabric, stitching on drawings as well as quilting projects, making myself a couple of shirts (! ), creating new thermofax screens, making books, teaching bookmaking, creating a sketching bag and riding my bike (that’s creative too!) to name a few things. I’d love to win one of your beautiful stamps Pam! Pam, thanks so much for the great giveaway opportunity. What fun. I love your stamps and your inspirational art. You are so talented! This summer I have been working on art journaling pages and mail art. In addition, I belong to a group where I live called the Salisbury Book Artists and we are working on color book pages for one another similar to the True Colors’ project. That has been a lot of fun. Should I win one of your stamps, please email me at bkisrael@gmail.com. Thanks again! Hi Pam, I took your online Portraits Class in Feb. since then I do continual portraits, each one better than the last. I am using them as covers for blank journals for my friends and family. I collage each one with other original artwork, sketch, watercolor, gel medium then I use pastels on top of everything to really make the colors pop. They are beautiful! Hi Pam, i love your Artwork and the new Stampcollection ist verry nice. hi Pam – love your new line of stamps! Hi Pam, It’s winter here in Western Australia, but this year I have been focusing on my photography – really need to get back to doing some art journaling. I had a busy and wonderful summer, too. I did get to spend some time on my art. I’ve tried lots of different avenues, and enjoyed them all, but after taking your “Still Pursuing Portraits” class at Artful Gathering, I have a new passion. I learned so much and made some good art friends there. I’m now taking two follow-up classes on faces. You created a monster!! If I hadn’t taken your class, I would still be saying “I can’t draw anything”. Thank you. Pam, I love your page. It is so beautiful to see how you use the stamp and add to it. I am new to stamps and need the inspiration! Thanks. Well it’s winter here but I have been doing a bit of artjournalling. Unfortunately the three yr old keeps going in my art room when I am not looking and adding his own efforts to the page. :(. Still it doesn’t stop me from playing.